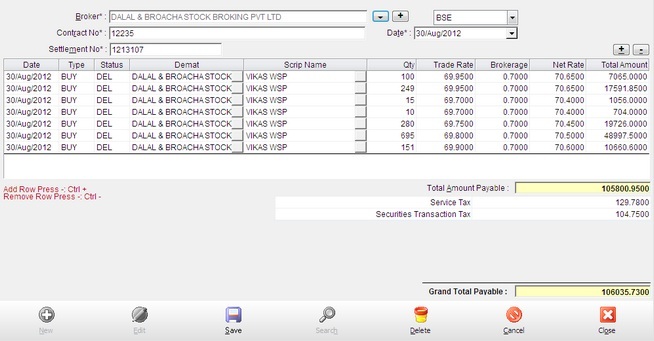 In this module, you can enter details of your transactions from Broker’s bill. Select a settlement & broker and bill no.for the bill entry. Enter the contract note , date, type either bought, sold, then select proper status e.g. TRD for trading, DEL for delivery. Entry of contract note is optional but you should enter the contract no. if you want contract wise report on broker’s bill. To facilitate manual entry for broker’s bill, the next line automatically shows the details of first entry so that you have to fill only quantity and rate in case of repetitive entries. Broker Select scrip from list. Contract No. Select contract no from list. Date (Date) Enter date here which is must be in between financial year. Statement No Enter statement no. Broker bill table Date: Enter date here which is must be in between financial year. Type: select type from list. Status: select status from list. Demat Name: select demat name from list. Scrip Name: select scrip name from list. Trade Rate: Enter trade rate here. Brokerage : Enter brokerage amount per qty here. Net Rate: Enter net rate here. Expenses : Enter Service Tax,Transaction Charge,STT,Stamp duty,Other charges etc. here. Total amount: auto calculate field. Total Amount receivable / payable After add all scrip record at last you can see that weather all amount will receivable or payable.